Making a whole roast chicken is one of the best things. Not only is buying a whole chicken cost effective, it lasts for the entire week! You can then make other dishes with a whole roast chicken, like tacos, chicken salad, pasta, and so much more! I love this recipe. Not only does the chicken some out moist and tender, the citrus flavor comes right through. I love anything with herbs and this has two — thyme and rosemary. My favorite is definitely rosemary and it goes SO well with the butter. Try making this whole roast chicken on a Sunday afternoon and you’ll have tons of leftovers for later. This is perfect for meal planning for the entire week. Chicken tacos anyone? This roast chicken would pair great with butternut squash and kale farro salad, cauliflower “risotto”, or roasted Brussels sprouts. Yum! This lemon butter roast chicken is great for family dinners. 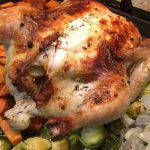 Making a whole roast chicken is cost effective & perfect for meal planning for the entire week! Mix butter, garlic, thyme, minced rosemary, juice of two lemons, salt and pepper. Pat the chicken dry and rub half of the butter mixture under the skin. Pour remaining mixture over the chicken and season with salt and pepper. Slice remaining lemon and stuff the chicken with the lemon, garlic cloves, and rosemary sprigs. Roast for 30 minutes then reduce heat to 350 degrees F. Baste chicken and vegetables with juices. Roast additional 20-25 minutes or until chicken reaches an internal temperature of 165 degrees F.